Join us on Missouri's Mark Twain National Forest for the third phase of rehabilitation work at the historic Greer Mill, a fascinating piece of Ozark history! 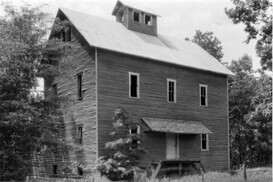 Greer Mill is a majestic structure in a wooded setting above the dramatic landscape of Greer Spring, but time, the elements, and lack of use have taken their toll on this National Register-listed property. So, once again, we need your help to return the mill to its former glory! PIT volunteers and Forest Service staff will join preservation experts from HistoriCorps. During two, week-long sessions, volunteers will have the opportunity to pick up new skills (or hone existing ones) as they are taught to repair and stabilize the structure. HistoriCorps will provide the tools, safety equipment, training, and three square meals per day! The Mark Twain National Forest also offers a variety of recreational opportunities for you to take advantage of during your "off hours," including canoeing/kayaking, hiking, wildlife viewing, hunting and horseback riding. You'll meet great people, enjoy delicious cast iron cooking and gain the satisfaction of saving this important piece of history - sign up today!